©DR Following the debate organized by Fondation Hirondelle's Afrik Activ' project at the CCI of Abidjan on March 9, 2018. 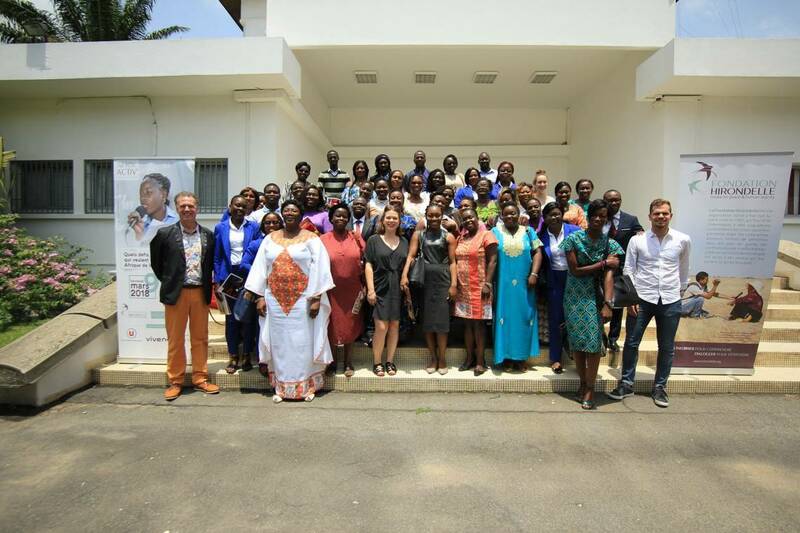 Following International Women's Day, our project Afrik Activ' organized a debate at the Chamber of Commerce and Industry in Abidjan, Ivory Coast on March 9, 2018, about the challenges for women who want to launch a business in West Africa. On stage, were 4 experts: Mariam Diaby, creator of the Nappy Babi community (diminutive of Abidjan) and creator of a "biO" hair salon ; Michelle Okei, Director of Studies at Michelle Yakice International Business School; Yheni Djidji, blogger and creator of the publishing agency "Livresque" ; Marie Bonnefois, Empow'here Project Manager in Côte d'Ivoire. In the room, a huge majority of women, most of them young. And some men, young people too. To moderate the discussion, two journalists : Rita Dro, journalist for Afrik Activ', Fondation Hirondelle's information platform for young entrepreneurs in Africa, and Rémy-Césaire Tshamala, journalist for the Kandindi agency in the DRC. The meeting was organised like a radio or television show. It was structured in 3 sequences: what difficulties for the women who want to create their business ? how do women overcome them? what are the possibilities for improving the situation? The experts brought their contribution, but without these preliminary presentations which often "kill" this kind of meeting. The editorial approach was designed to facilitate dialogue with the room. The discussion was sequenced in twenty-five minutes slots, with ten minutes for the experts, ten for the audience. The interventions were concrete, useful. By the way, Why do women want to do business? - "First to earn money and free themselves from the economic expense of their husbands, brothers. They want to gain autonomy ". - "We must force ourselves to rigor, learn to build a business plan, no longer mix private money and that of our activities ... But how to do when you can not read. But many of us still do not have this training, "etc. Not one aggressive word was launched against men. On the contrary: many behaviors and situations are to improve, to change, but with them. Under the words appears a buoyant breath, very enthusiastic, in favor of empowerment certainly, but for education, a better life, a desire for common construction. A breath that burst with great joy on the steps of the CCI of Abidjan, at the time of the final photograph.